I am SHATTERED and want to go to bed, but I have received 3 tags today so thought I ought to take care of at least one of them before bed. 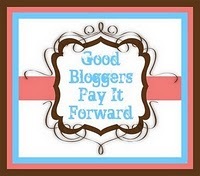 The wonderful Mum in Meltdown has awarded me a Pay it Forward tag. 1. Put the award badge at the top of your post...............Done! 2. Refer to the lovely blogger who awarded it............Proudly done! 3. Pass it on to 5 others................................ hhhhmmmm let's think! Only being able to choose 5 means of course I have had to neglect some wonderful bloggers...... which makes me sad, but rules are rules....... so that's my five. They are all ladies I have got to know so well, I feel like they are friends now, and have even met 2 of them in person at the Nivea event and we will ALL meet at Cybermummy. Of course they are ALL Mumentum ladies, as the whole thing about Mumentum was that it started with a group of blog friends talking about a joint concern - the Mum Tum!